First, a word on Stephen Tanzer. He has long been considered by many, including myself, as one of the most accurate critics in writing tasting notes. Moreover, during an era of grade inflation, he has largely resisted. His top-scoring wine in this particular article, for example, gets only 97 points. 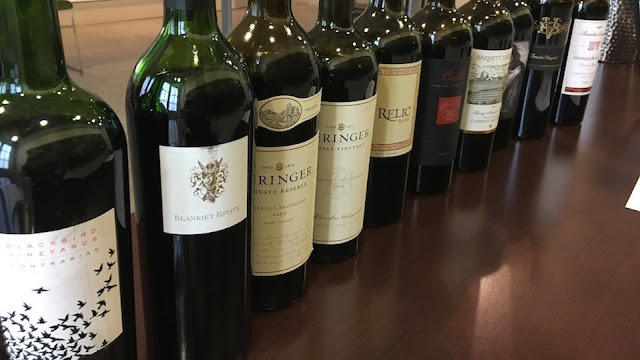 Robert Parker gave out 19 perfect 100-point scores when grading the 2007 Napa vintage. Tanzer is like a TV sports analyst who doesn't scream: he hasn't gotten much attention, but he has been right much more often. Now about those failed wines. Tanzer doesn't list the 36 he considered undrinkable. What he does list, though, are the 14 wines he gave 85 or 86 points, with no tasting notes. You might think that sounds like a pretty good score, and if you were paying $12 for the wine it might be. Slightly high-toned aromas of blackberry, cassis, licorice, minerals, bitter chocolate, espresso and coffee grounds, plus a hint of adhesive tape that dissipated with air. High-pitched crushed-berry fruit shows an herbal pungency but I find this too tight and green and lacking in generosity. The rather gritty finish betrays a note of peppery bitterness. With its green streak, this is unlikely to improve with more time in the cellar, but if you own a bottle or two, I would still wait a few more years. How much would you pay for that wine? It doesn't sound terrible, but it also doesn't sound like something he wants to drink. The current release of that wine sells for $180. I read all of the notes, and it's not until he gets to 89 that it sounds like he would personally drink (but not rave about) the wine. So that means that out of the 179 wines he tasted, 68 were disappointing: 36 undrinkably below 85 points, 14 at 85 or 86 with no tasting notes; another 18 in the gray area of 87 or 88 points. That's 38 percent. So if you bought a random 2007 Napa Valley Cabernet on release, according to Tanzer, you'd have a 62 percent chance of enjoying it today. Is that good or bad? How does it compare to other expensive wines, like top Burgundies? I'm not sure. It is worth keeping in mind if you're thinking about splurging: one out of every three bottles, you might end up disliking. Anyway, I couldn't look up the 36 wines he didn't rate, but I did look up the current-release prices of the 14 he gave 85 or 86. I couldn't find a good way to get the release prices at the time. This would be an issue with Bordeaux, where prices go up and down with every vintage. It is less so with Napa Valley, where prices never go down: today's $100 wine might be $150 in seven years or it might not, but it certainly will not be $75. The good news is that most of the 13 mediocre wines at the bottom of Tanzer's chart are, for Napa Valley, not the most expensive. Four cost $50 to buy a current vintage. Only three are over $100. The most expensive cost $200, and you'd be unhappy if you spent $200 for a wine that was only barely drinkable, but it was an exception. Conversely, his top-scoring wines are all expensive, famous names. There's not one wine in his top 30 that would be a surprise to those who follow Napa Cabs. It's a little depressing: if you're looking for the great $50 Napa Cab that ages just as well as the $300 bottles, according to Tanzer, it doesn't exist. It seems like this is not news. But it is, actually. Not particularly happy news, if you're a bargain shopper. Tanzer won't exactly say you get what you pay for in Napa Cabernet. But you don't get what you don't pay for. Read Stephen Tanzer's story here. "I couldn't find a good way to get the release prices at the time." Perhaps accessing Wine Spectator's or Wine Enthusiast's printed paperback format "Buying Guide" that covered the 2007 vintage Cabernets and Cab-blends might yield that pricing info? Bob: It's a good idea. Do you have one? I do not. Possibly the print editions gave way to reviews accessed by smartphone apps? You can access the Wine Enthusiast website for discrete reviews. To the best of my knowledge, only online subscribers to Wine Spectator can access reviews via their website. Let me revise the advice I gave in a comment awaiting "moderation." Using this link . . .
. . . navigate to the search box, and backspace out the brand name Araujo. Then type in (without any reference to vintage) the next brand name of California Cabernet or Cab-blend you seek. Then scroll down the research result listings until you find the 2007 bottling. I had to go to comment moderation to prevent nefarious spam. Once they realize your website is a target, they're on it every day, putting up bogus comments with links back to their bogus websites that they hope will improve the legitimacy rating of their bogus websites. You can look all this up. When a comment is held for moderation, I don't look at it until I'm in front of my computer. Thus if you were to post a comment on an old post right now, while I'm here typing this, I would see it right away and most likely just publish it, unless it runs afoul of my guidelines. BUT if you happen to post a comment at a time when I'm, say, on an airplane to Italy (lucky me), it will be a while before I see it and deal with it, sometimes even a few days. The moderation decision, if there is one, never takes long at all. I'm just not one of those people who's constantly online. Regarding comment moderation, I surmised that was your practice. I can't imagine any wine blogger so fixated on receiving reader omments that they set up a notice mechanism via their smartphone. That proverbial ringing bell is too Pavlovian. I'm also not one of those folks who's constantly online. As William Shatner said in that famous SNL "Star Trek" skit: "Get a life, will you people?!" Me? I'm living my life OFFline. Not subject to Fear Of Missing Out. Good article - shared. Count me in the "very disappointed" category if I pay $50+ for a Cab that is not enjoyable.